Domestic and international orders are recieved 24/7 and processed within 3 hours for payment via a secure server and payment processing. When completing the shopping cart you must type all discounts, promo codes and gift certificates. Questions please call sales at 508-580-1220 before you place your order. Customer service is here to help you but unable to take phone orders or create add ons after you placed your order. If after hours please leave a message, order ID, time and date we will return your call. Orders with glass sheets will be charged an additional charge for glass boxing. 1-13 sheets +$10, 14-26 sheets +$14.50, over 27 sheets +$20, PLUS your UPS or USPS shipping charges. Orders with steel or zinc came require special boxing, 35" boxes, or over will be charged $12.50 per box for UPS oversize, plus shipping when we process your order. Please add enough steel or zinc to pay for this special boxing. Address corrections, error or re directing packages after an order leaves our building will be charged $18 for UPS address corrections and modifications. Please: check your shipping address before completing your order. You must use complete address info like apartment #, floor #,unit # suite # etc. If not on your shipping information and UPS performs an address modification to deliver, the $18 fee will be charged to your order. Disclaimer- Glass colors will vary from digital photo's on your monitor. Tool colors (plastic) may vary from the manufacture. 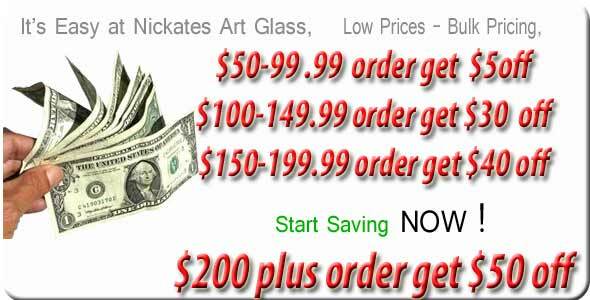 All glass sizes are approximate and will be off plus or minus 1/4". All prices on our web site are subject to change without notice. Promotional FREE items have no dollar value and are not available on iternational orders. Some products on our web site are shipped FREE via UPS ground. Mixing FREE shipping produts with other items will reflect a shipping charge. FREE shipping products are limited to within the contiguous USA states. Our web site is connected directly to UPS for shipping rates based on your shipping zip and weight. 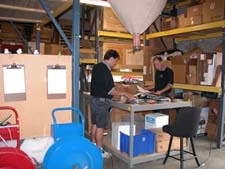 We only use UPS dependable ground shipping service on domestic orders. Receiving your box in good condition is our goal. Most orders are processed the same day. Large orders, school or class orders may require an extra day to process. All items are stocked at our building for immediate shipping without delay. If an item is marked on your invoice (out of stock) the item will ship within 10 days at no additional charge. If an item will be out of stock for more than 10 days you will not be charged for the item and need to reorder at a later date. All domestic orders are shipped via UPS. Our shipping success track record is 99.7% but damages will happen. You must call our office within 2 days of delivery and express damage, missing items. IF your box was shipped via UPS we will handle issues related to damages for you. NOTE: per UPS terms and conditions. You must save all boxing and damaged items for UPS to inspect for 5 working days after you contact us. International boxes shipped via USPS ( you are responsable to bring the box, packing and contents back to your local post office for them to inspect. They will initiate a damage claim at that time. Please note that the Post Office may take up to a year for your USPS international claims to be resolved). Items with a warranty by a manufactured like Inland, Glastar, Mika, Gryphon, Diamond Tech and other companies are covered by expressed warranty terms with you the end user. Their products are not returnable to us for a refund, replacement or repairs, all sales are final on their products. Companies with an expressed warranty are concerned with your satisfaction and will reflect their warranty directly with you. Nickates is not authorized to accept returns or perform repairs on warranty merchandise. Send in your warranty cards and save your invoice. No returns on, Used or opened products, Video's, Software, CD's, Books, Chemicals, Glass, Lead Came, Grinders, Band saws or Special orders. Shipping charges and extra boxing fee's on your invoice are not re-fund able under any circumstances. You must call our office with your Invoice # to receive a return merchandise authorization number within 10 days of your invoice. Returns without an RMA # will not be accepted. All (products, orders) returned, refused or canceled are subject to a 20% none re-fundable processing fee. Credit card charge back disputes will reflect a $25 fee if we are not responsable for claims. Pricing, terms and conditions are subject to change without notice. Please review terms and conditions prior to ordering.